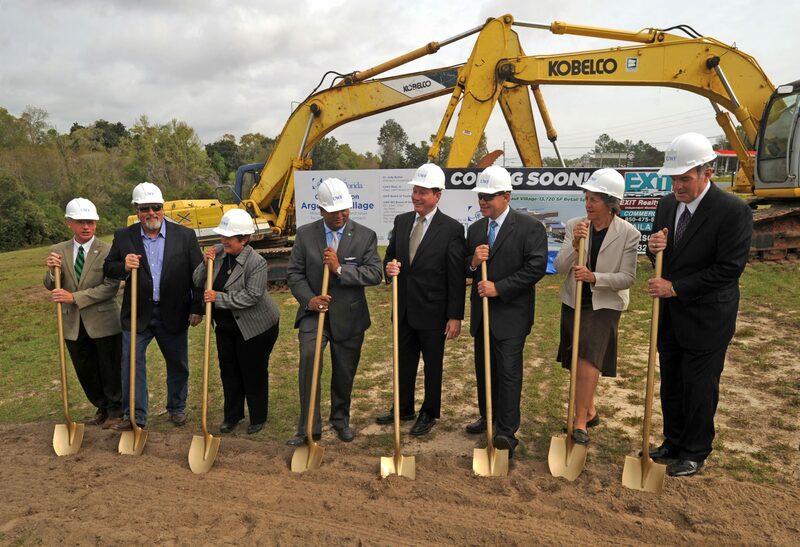 University of West Florida Business Enterprises, Inc. hosted a groundbreaking ceremony today to mark the beginning of construction on the East Campus Restaurant Development Site. UWF BEI and Compass/Chartwells are partnering for the development project, which will feature restaurant and retail facilities that will transform the University’s east campus entrance at the intersection of Highway 90 and Campus Drive into a vibrant atmosphere that will attract UWF students, faculty, staff, prospective students and visitors of the Northwest Florida region. The East Campus Restaurant Development Site will feature a mix of retail price points targeted for the University community as well as the general public. The restaurants and retail facilities will be identified this spring, with some of the first businesses expected to open in Winter 2014. The UWF Board of Trustees approved the Development Agreement and Right of Entry document for the East Campus project during its March 26 meeting, marking the final step in the approval process before construction could begin. Before it was presented to the full Board of Trustees, the document was approved by the UWF BEI Board of Directors and ratified by the UWF Board of Trustees Finance and Facilities Committee. For additional information about the East Campus Restaurant Development Site, visit uwf.edu/bei.